Vintage linens are truly lovely. Their delicate details make them textile works of art. However, they are often stained from years of use, making it a challenge to use them for their intended purposes. 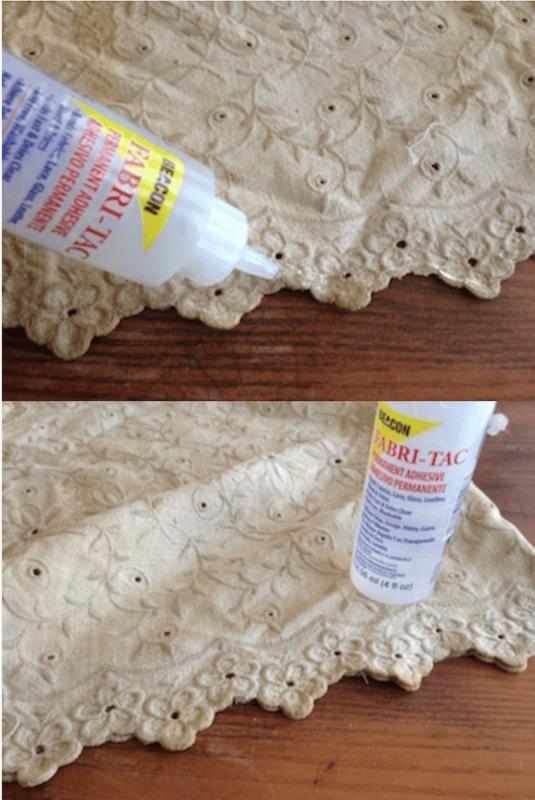 This is a simple way to use a repurpose those vintage pieces, whether stained or not, into unique, shabby chic home decor accents. The tea dying process helps disguise any stains because the process itself leads to a bit of an “uneven” dyed end result! 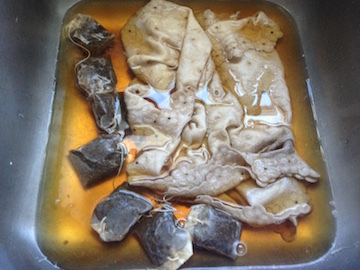 To tea-dye vintage linens to help disguise stains, boil enough hot water with multiple tea bags to submerge your fabric. Submerge fabric and let set about 30 minutes. Remove and lay flat to dry. When fully dry, iron lightly. 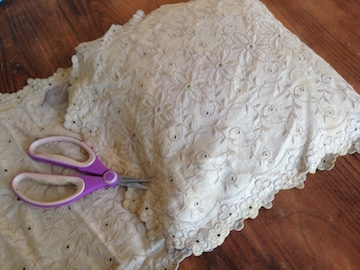 Use pillow form as a guide to determine where to cut your fabric. I wanted the embroidered sides of my piece ot show on the finished pillow, so I applied Beacon Fabri-Tac along the edge of the floral border and pressed to seal the sides. 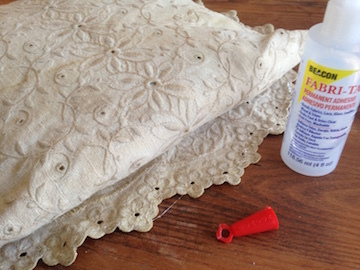 When the adhesive was dry, I inserted the pillow form. 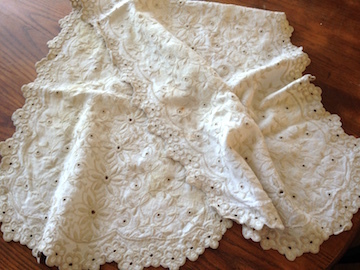 If your fabric does not have a decorative edge, turn inside out, glue side seams together, then return to right side and insert pillow form before proceeding to next step. Again, because I wanted the embroidered edge to show, I folded the cut side up onto the pillow and glued in place, then folded the detailed side down over that and adhered in place. If your fabric is cut so there is not a decorative edge, glue one edge in place and then fold over to form a hem and glue second edge in place.